I’ve recently had the honour of being elected President of Bestwood Male Voice Choir and it is an awesome privilege following in the footsteps of two colossi of the Choir, Len Hogg and Howard Leese. In the preface to the old Methodist Hymn Book it says that “Methodism was born in song” and it seems that I was also born into song as singing has always been an important part of my life. My mother sang in a ladies’ choir and her father was a member of Earl Shilton MVC. I was born and bred in Stapleford and I’ve always lived in Nottinghamshire. Choirs have always been central in my life starting with the junior chapel choir, school choir, school 4- part harmony group, chapel choir, Nottinghamshire Police MVC and since 2003, Bestwood Male Voice Choir. Bestwood MVC not only has a reputation for quality singing but boasts many friendships that have grown up over the years, both within the choir and with overseas friendships forged through exchange visits. In 2012 we celebrated our Diamond Jubilee, and the future . . . ? Onwards and upwards! Mirek was born in Poland but brought up and educated in Essex. After graduating in modern languages from Sheffield University, he moved to Nottingham through his work in local government. 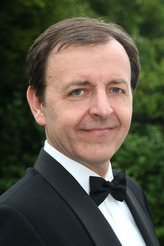 Mirek joined the choir in 1992 as a singer in the second tenor section and within a short space of time he was helping with accompaniments at rehearsals and soon began to show interest and ability in conducting. Upon the retirement of the choir’s then deputy conductor, Howard Leese, Mirek made the natural progression into the vacancy. During this time Mirek was also choir chairman, a position he held for the two previous years. 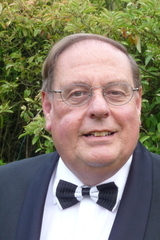 He relinquished both positions in January 1997 when invited to become the choir’s Musical Director. Hilary is a graduate of the Royal Northern College of Music, where her studies with John Wilson, Kendal Taylor and Ida Carroll helped her achieve the highest grades amongst the graduates in her year. In the world of choral music, Hilary has conducted several choirs and is in demand as an accompanist for operatic societies, choral groups, singers and instrumentalists. Her career in education included working as a peripatetic teacher of piano and strings in the City of Leicester where she was head of cello teaching. Other positions have included that of head of music in schools in Leicester, Derbyshire and Nottinghamshire and acting as an advisory teacher on Leicestershire schools. As a performer, Hilary has enjoyed working with eminent conductors and during the last few years has become a founder member of the harp orchestra of 22 players - "Harp Attack"! Each week at rehearsal and at every concert we are supported by our Ladies Group. They help raise funds for the Choir by organising a weekly raffle at rehearsal.